Video door entry system is a system used in the main gate of a house to help the insider talk to the outsider easily before allowing the later to come inside. Again, the visiting person also gives his identity from outside and makes the insider believe about his identity. After being sure the insider allows the outsider to come in. 1)Camera- It is placed outside of the building. So that the visitor can be seen easily from the inside. It also has night vision ability. So surveillance in night is not impossible. 2)Indoor Monitor- It helps the person sitting inside to look who is at the door. The video input comes from the camera put outside. 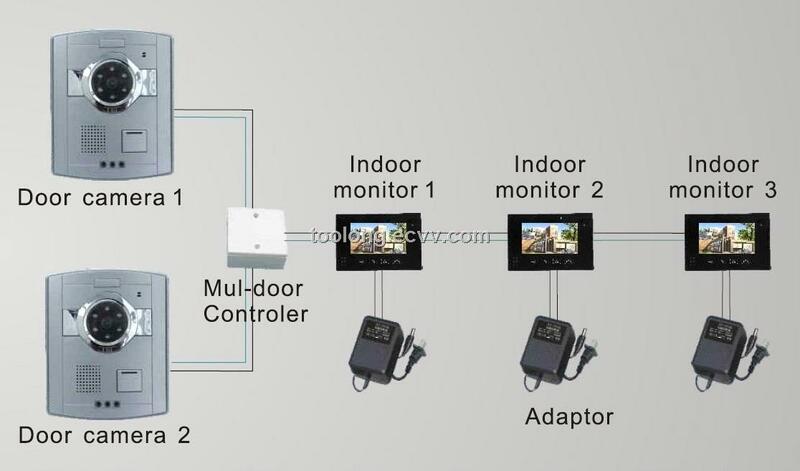 The video monitor can be set in any place according to the user’s choice. 3)Microphone- It is used to capture the voice of the visitor in case it is required to clarify something before allowing entrance. The insider can ask questions and get the answers from the outsider. 4)Outdoor Panel- It consists of a numeric keypad and a microphone. Visitor can dial a particular number in order to make a call to a particular person living in a large building. The outdoor panel is put on the wall commonly. 5)Electronic Lock- It is an electronic device which works using electric current. The key to this lock can easily be changed or added and it has an advanced access control where usage logs are recorded. Along with these basic functionalities several other functions can be added to it. Like automatic entrance where owner of a house can unlock the door if his face matches with the preset face of the system. Especially handicapped persons find this facility very useful. 1)Security- Security is the main reason for Video door Entry System’s popularity. As the door cannot be unlocked unless the person inside is allowing to, no rogue outsider can access the house easily. Usage of electronic lock has increased people’s confidence in it. 2)All time Functional- These equipments are quite adaptive. They don’t go bad suddenly; they work throughout the year regardless the condition of the climate. 3)Low Voltage Requirement- They run on very low voltage. So electric bill is not quite high to run them. They can run on building’s trunk power. So even if the power is cut, it should not be a problem to run it. 4)Log file- If unluckily any accident happens like stealing or murder or anything else, the Police can take help from the log files of this system. Final Judgement- If anybody wants to make his home secure, it is expected to use a Video Door Entry System. It is not dear with respect to its service. So putting it in the house would be a wise man’s decision. The reason is “Prevention is always better than cure”.